After the T and S ranges, Sammic presents two new lines: the SE Line and the SU Line. In both lines the vacuum is controlled by a high precision sensor that ensures the results are accurate and consistent and provides security in packaging of liquids. The SE line is equipped with a new plate that uses a single program to adjust the vacuum percentage and includes an option to program up to 10 seconds of vacuum "plus". The SU line features vacuum control by sensor with the display of all the vacuum program values on a 3.9" LCD colour screen. Vacuum packaging retards bacterial growth in raw or cured foods, keeping their qualities intact for a longer life. It enables rational storage and a quick response to demand. Controlled temperature cooking is an increasingly popular culinary technique due to its numerous advantages. Vacuum packing the food is a required condition of this technique. Packaging food in a protective atmosphere is useful for both enhancing the conservation and presentation conditions of the products and for packing fragile products that would not withstand airless packaging. Freezing vacuum-packed products keeps foodstuffs under optimal conservation conditions. Vacuum packaging is not only useful for food but also for other products that require special protection. It enables better organisation of the workday and to make use of downtime to obtain the maximum yield per man-hour. It enables regular dosage of the portions, which in turn allows accurate cost control and reduction of waste. Since it is isolated from external contaminants, vacuum packed food is stored under the best hygiene conditions. Packaging foodstuffs in a protective atmosphere is useful not only for improving conservation and presentation conditions but also for packing fragile products that would not withstand airless packaging. 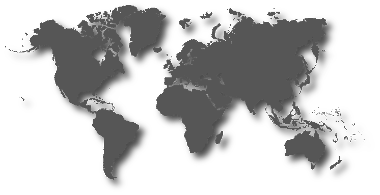 It enables better stock control and rationalization of procurement. Moreover, larger orders can be placed since vacuum packing enables food to be stored for longer periods, thus reducing transport time and costs while strengthening your negotiating position with suppliers. 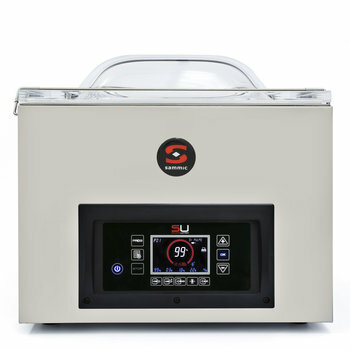 Both the body and the vacuum chamber are made of high quality stainless steel. The cameras are recessed in the 200, 300 and 400 series. The cover is made of highly durable transparent polycarbonate with machined and polished edges. The cover is fitted with gas dampers to ensure smooth opening. Equipped with robust, reliable, high quality Busch pumps. Advanced features enable significantly longer useful life of the vacuum pumps. They are equipped with a pump-drying program that keeps the pumps in optimal condition. Fitted with an operating hours counter display for the oil change that improves the durability of the machine. The sealed, advanced performance digital control panel enables precision control over operation of the packaging machines. The sequence is controlled by a high-precision microprocessor that controls the vacuum percentage in the chamber, thus enabling accurate and consistent results at all times. Provided with a STOP pushbutton to end the vacuum stage and pass on to the next phase. Option of programming up to 10” of additional vacuum in the event of having selected a 99% vacuum. Equipped with bars fitted with dual bead sealing to ensure perfect sealing of the bag at all times. From the 400 series the bars are fitted with curved elements that enable removal of remains of the product and ensure that the sealing is hermetic. Certified by NSF International under the NSF/ANSI standard. The cableless sealing bar enables an obstacle-free chamber and makes it easier to clean and maintain in satisfactory hygienic conditions. In the 200, 300 and 400 series are equipped with embedded 304 stainless steel vacuum chambers free of sharp edges and with rounded contours to facilitate cleaning. Packs of vacuum bags of different sizes. Vac-Norm exterior vacuum kit to produce a vacuum in containers especially designed for the purpose. Top quality tubs and lids for producing the vacuum without a bag, using the Vac-Norm external vacuum kit. By replacing the double sealing bar with the bag cutting kit the excess bag will be automatically cut at the time it is sealed. Bracket that enables liquids to be placed in the proper position for packaging, preventing them from spilling during the process. Filler plates that enable the product to be placed at the proper height to obtain perfect sealing and better performance during the packaging process due to the fact that they reduce the time required to obtain the desired vacuum. Impulse-controlled decompression enables the air to re-enter the chamber little by little once the bag has been sealed. This prevents any damage to the product or the bag. Equipped with a microprocessor that enables pre-setting of the lowest vacuum level consistent with packaging liquids at ambient temperature, providing safety in packaging of liquids and precluding the risk of splashing or spillage. Pre-installed for connection to the Vac-Norm external vacuum kit. Control of the sensor and automatic decompression for removal of the tube at the end of the sequence that prevent loss of the vacuum through the valve at the end of each cycle. They include the option of performing packaging cycles only for sealing bags. It is only necessary to enter a lower vacuum when programming the sequence. “Pause” button that enables freezing the vacuum phase and re-starting from the same point. Especially useful for marinating the products in a recipe. Equipped with a safety system with protection against exceeding maximum operating time and vacuum failure. Backlighted tactile keyboard made of anti-scratch glass protected against water splashes that detects fingers in latex gloves. Vacuum percentage and vacuum pressure in absolute values (mbar/hPa). Text display with 6 languages for display of the list of products and information of each program phase. Status of the printer and values to be printed on the label. Detection of evaporation of liquids alert. Status of the Bluetooth connection with the mobile device. Option of storing 25 different vacuum programs. Phased vacuum program for soft, porous products. Fitted with a soft air inlet valve into the chamber for progressive decompression to avoid perforation of the bag in the event of products with sharp edges. The SU packaging machines are equipped with a system for detecting the evaporation point of sauces, soups, fruits, red meat, etc. which automatically stops the vacuum process, preventing spillage of liquid into the chamber and ensuring the maximum possible vacuum for each product. Pause button that enables freezing the vacuum phase and re-starting from the same point. Especially useful for marinating the products in a recipe. Optional label printing system on all models. Low temperatures-resistant laminated adhesive labels. Free SmartVac App: Connected to the packaging machine by Bluetooth and enables modification of programs, design of labels and assignment of labels to the programs. Entry of texts for labelling using the SmartVac app. Printer connected to the packager by cable and automatic printing of labels at the end of each sequence. Installation of optional inert gas injection system on all models to enable packaging with protective atmosphere. Depending on the gas employed and the product to be packaged, it obtains enhanced conservation of the product, improvement in its appearance and avoids damage in the case of fragile products. Option of adding the sealing + application that increases the electrical power for sealing metallic type bags by simply pressing a key. 6 m3/h Vacuum Sealer SE-206 Tabletop model. 6 m³/h. 280 mm. 6 m3/h Vacuum Sealer SE-306 Tabletop model. 6 m³/h. 320 mm. 16 m3/h Vacuum Sealer SE-316 Tabletop model. 16 m³/h. 320 mm. 10 m3/h Vacuum Sealer SE-410 Tabletop model. 10 m³/h. 420 mm. 16 m3/h Vacuum Sealer SE-416 Tabletop model. 16 m³/h. 420 mm. 20 m3/h Vacuum Sealer SE-520 Tabletop model. 20m³/h. 420+420 mm. 40 m3/h Vacuum Sealer SE-604 Floorstanding unit. 40 m³/h. 413+656 mm. 40 m3/h Vacuum Sealer SE-604CC Floorstanding unit. 40m³/h. 465+465 mm. 63 m3/h Vacuum Sealer SE-606 Floorstanding unit. 63 m³/h. 413+656 mm. 63 m3/h Vacuum Sealer SE-606CC Floorstanding unit. 63 m³/h. 465+465 mm. 63 m3/h Vacuum Sealer SE-806 Floorstanding unit. 63 m³/h. 530+848 mm. 63 m3/h Vacuum Sealer SE-806CC Floorstanding unit. 63 m³/h. 581+581 mm. 63 m3/h Vacuum Sealer SE-806LL Floorstanding unit. 63 m³/h. 848+848 mm. 100 m3/h Vacuum Sealer SE-810 Floorstanding unit. 100 m³/h. 530+848 mm. 100 m3/h Vacuum Sealer SE-810CC Floorstanding unit. 100 m³/h. 581+581 mm. 100 m3/h Vacuum Sealer SE-810 LL Floorstanding unit. 100 m³/h. 848+848 mm. 420 mm Vacuum Sealer SU-520P Tabletop model. 20m³/h. 420+420 mm. 413 mm Vacuum Sealer SU-604 Floorstanding unit. 40 m³/h. 413+656 mm. 413 mm Vacuum Sealer SU-606P Floorstanding unit. 63 m³/h. 413+656 mm. 465 mm Vacuum Sealer SU-604CC Floorstanding unit. 40m³/h. 465+465 mm. 465 mm Vacuum Sealer SU-606CC Floorstanding unit. 63 m³/h. 465+465 mm. 530 mm Vacuum Sealer SU-806 Floorstanding unit. 63 m³/h. 530+848 mm. 581 mm Vacuum Sealer SU-806CC Floorstanding unit. 63 m³/h. 581+581 mm. 848 mm Vacuum Sealer SU-806LL Floorstanding unit. 63 m³/h. 848+848 mm. 530 mm Vacuum Sealer SU-810P Floorstanding unit. 100m³/h. 530+848 mm. 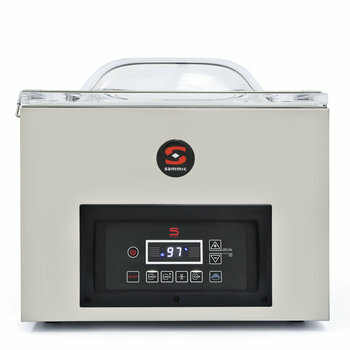 581 mm Vacuum Sealer SU-810CC Floorstanding unit. 100m³/h. 581+581 mm. 848 mm Vacuum Sealer SU-810LL Floorstanding unit. 100m³/h. 848+848 mm. 662 mm Vacuum Sealer SU-6100P Double chamber vacuum packing machine. 100m³/h. 662 mm Vacuum Sealer SU-6160P Double chamber vacuum packing machine. 160m³/h. When vacuuming liquids we cannot exceed the percentage of vacuum reached at the boiling point of the liquid or the sauce that we are packaging. Or can we? Vacuum PLUS enables you to extract air from the chamber for a few seconds more and therefore achieve a higher shelf life of the product and a better quality. The SU packaging machines have a soft air inlet valve into the chamber for progressive decompression. Did you know that the new Sammic SU vacuum packaging machines equipped with the Bluetooth + Printer option enable labels to be printed directly?